Overcome everyday obstacles, boost confidence, and end self-critical thoughts with simple life lessons from internationally recognized psychotherapist Lisa Ferentz. With more than 30 years of clinical experience, Lisa blends time-tested approaches and journaling space to help you look inside yourself for tools to embrace change, take healthy risks, and increase self-compassion to nurture your personal and professional growth. Help your clients overcome everyday obstacles, boost confidence, and end self-critical thoughts with simple life lessons from internationally recognized psychotherapist Lisa Ferentz. With more than 30 years of clinical experience, Lisa blends time-tested approaches and the power of journaling to help clients look inside for tools to embrace change, take healthy risks, and increase self-compassion. 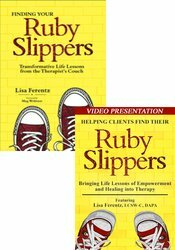 Implement at least four “life lessons” designed to help clients self-actualize and experience greater empowerment in their personal and professional lives. Exlore at least three therapeutic benefits of journaling and implement at least six journal prompts designed to improve positive self-talk, healthy risk taking, and overcome obstacles and fear. This self-study course has been approved by PESI, Inc., as a NAADAC Approved Education Provider, for 1 CE in the Counseling Services skill group. NAADAC Provider #77553. PESI, Inc. is responsible for all aspects of their programming. Full attendance is required; no partial credit will be awarded for partial attendance. California Alcoholism & Drug Abuse Counselors: PESI, Inc. is an approved provider by the CCAPP-EI, Provider #: OS-03-036-1019. This self-study activity meets the qualifications for 1 CEH's (continuing education hours). This intermediate self-study activity consists of 1 clock hours of continuing education instruction. Credit requirements and approvals vary per state board regulations. Please save the course outline, the certificate of completion you receive from the activity and contact your state board or organization to determine specific filing requirements. South Carolina Counselors, Marriage & Family Therapists and Psycho-Educational Specialists: This program has been approved for 1 continuing education hours by the South Carolina Board of Examiners for Licensure of Professional Counselors, Marriage and Family Therapists, and Psycho-Educational Specialists. Provider #4540. Texas Counselors: PESI, Inc. has been approved as a continuing education sponsor through the Texas State Board of Examiners of Professional Counselors. Provider #: 2477. This self-study course qualifies for 1 continuing education credits. Illinois Marriage & Family Therapists: PESI, Inc. has been approved as a provider of continuing education by the State of Illinois, Department of Professional Regulation. Provider #: 168-000156. Full attendance at this self-study activity qualifies for 1 credits. Texas Marriage & Family Therapists: PESI, Inc. has been approved as a continuing education sponsor through the Texas State Board of Examiners of Marriage and Family Therapists. Provider #: 503. This self-study activity qualifies for 1 continuing education credits. This intermediate activity consists of 1 clock hours of continuing education instruction. Credit requirements and approvals vary per state board regulations. Please contact your licensing board to determine if they accept programs or providers approved by other national or state licensing boards. A certificate of attendance will be awarded at the end of the program to participants who are in full attendance and who complete the program evaluation. California Nurses: PESI, Inc. is a provider approved by the California Board of Registered Nursing, Provider #:17118 for 1 self-study contact hours. Florida Nurses: PESI, Inc. is an approved provider by the Florida Board of Nursing. Provider #: FBN2858. These materials qualify for 1 self-study contact hours. Canadian Psychologists: PESI, Inc. is approved by the Canadian Psychological Association to offer continuing education for psychologists. PESI, Inc. maintains responsibility for the program. This program is approved for 1 self-study continuing education hours. Florida Board of Psychology: PESI, Inc., is an approved provider with the Florida Board of Psychology. Provider Number 50-399. This product qualifies for 1 self-study continuing education credits. Please make sure to bring your license number to the seminar so that we can report your attendance to CE Brokers. California Social Workers/ Counselors/Marriage & Family Therapists/Licensed Educational Psychologists: This intermediate activity consists of 1 clock hours of continuing education instruction. Credit requirements and approvals vary per state board regulations. Please contact your licensing board to determine if they accept programs or providers approved by other national or state licensing boards. A certificate of attendance will be awarded at the end of the program to participants who are in full attendance and who complete the program evaluation. Florida Social Workers/Marriage & Family Therapists/Mental Health Counselors: PESI, Inc. is an approved provider with the Florida Board of Clinical Social Work, Marriage and Family Therapy and Mental Health Counseling. Provider Number 50-399. This self-study course qualifies for 1 continuing education credits. Illinois Social Workers: PESI, Inc. is an approved provider with the State of Illinois, Department of Professional Regulation. License #: 159-000154. Successful completion of this self-study activity qualifies for 1 contact hours. Kansas Social Workers: PESI, Inc. is an approved provider with the Kansas Behavioral Sciences Regulatory Board. Provider #14-006. This self-study course has been approved for 1 continuing education hours. Minnesota Social Workers: PESI, Inc. is an approved provider with the State of Minnesota, Board of Social Work. Provider #: CEP-140. This self-study course has been approved for 1 continuing education hours. A certificate will be issued upon successful completion of a post-test. Ohio Social Workers/Counselors/Marriage & Family Therapists: PESI, Inc. is an approved provider with the State of Ohio Counselor, Social Worker and Marriage & Family Therapist Board. Provider approval #: RCST071001. Successful completion of this self-study course meets the qualifications for 1 clock hours of continuing education credit. Pennsylvania Social Workers/Counselors/Marriage & Family Therapists: This intermediate activity consists of 1 clock hours of continuing education instruction. Credit requirements and approvals vary per state board regulations. Please contact your licensing board to determine if they accept programs or providers approved by other national or state licensing boards. A certificate of attendance will be awarded at the end of the program to participants who are in full attendance and who complete the program evaluation. Full attendance is required, variable credits may not be awarded per the Pennsylvania State Board. This self-study activity qualifies for 1 clock hours of instructional content as required by many national, state and local licensing boards and professional organizations. Retain your certificate of completion and contact your board or organization for specific filing requirements. "Lisa Ferentz has written a thoughtful, engaging and practical book that invites readers to look at themselves and their lives without judgment. Her clients are lucky to have her voice dispensing these words, and now the rest of us are, too." "A magical guide to conquering our fears, phobias and emotional pain! With a warm and affirming tone that conveys, I get it! , Lisa Ferentz shares years of accumulated wisdom grounded in research but communicated as if she and the reader were simply sitting side-by-side, deep in conversation." "I absolutely love this book! A resource for people wanting to heal into the possibilities embodied in their present-day life, Lisa offers solid information and practices to free oneself from old patterns and behaviors. The questions at the end of each chapter deepen the reader s ability to recognize and experience what has held them back while also pointing them towards the healing that is available and possible in their current life. I recommend this book not only for individuals who seek to heal but also for clinicians who want solid and useful tools they can use with their clients and for their own personal growth." "I know Lisa Ferentz to be a very wise and talented therapist so it is not surprising that the wisdom culled from her long career would be simple but profound. You will find in the these pages things that you often say to yourself unconsciously, followed by Lisa s empathic yet liberating perspective on them. Enjoy and heal!"